Ryderwood Artisan Howard Replogle dresses the frets on the neck of an in-progress ukulele while finished models of varying sizes and composition are available for viewing and playing. The ninth annual Ryderwood Arts and Crafts Fair took place last weekend, kicking off the start of the 2013 holiday bazaar season. Craftspeople from Ryderwood, as well as the local area, were present with their hand-made wares, including newcomers Andrea Read and daughter Natalie Read. The Reads, from Toledo, said they have frequently visited such fairs as a family for holiday shopping, but had not set up a table until this year. The Reads said they were able to take out the space, at just $20 for a 6-foot table, as part of a group of craftspeople to include the Zucati family and the Hall family, also from the Toledo area. According to Natalie Read, her hand-crafted cards sold rather quickly, while other items like jars full of cookie mix and cocoa bottles decorated like snowmen were also available. 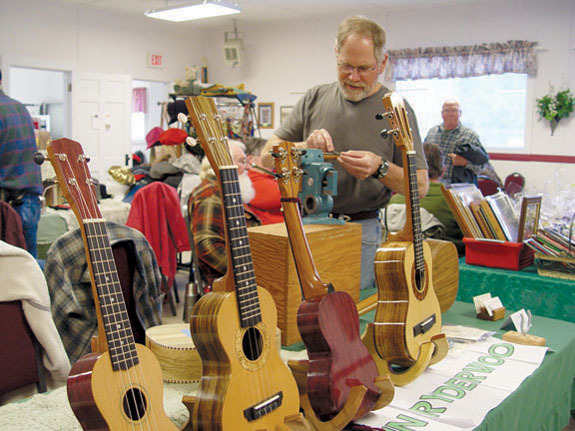 Also new to the fair was Ryderwood resident Howard Replogle, who sold handcrafted ukuleles while continuing to ply his craft there at the table. Replogle said he took up the hobby after seeing a ukulele kit his brother-in-law had purchased. He said he was inspired to build one from scratch after seeing the process of assembling the instrument. Everything on a Replogle ukulele is hand-made, apart from the strings and tuners, with Replogle stating he is able to buy the wood for his instruments direct from distributors in the Portland area. "I don’t do much of anything else," said the retired accountant of his hobby, stating he’s not treating it as a source of income but a form of art. "It’s not about money for me, it’s about the craft." Some vendors remained a fixture of the event, such as Bob Webster, who has been attending regularly at both the winter and spring craft fairs over the last decade. Webster’s table featured a wide array of woodwork crafted with a scroll saw and specifically geared toward the more masculine of fair-goers. "I make enough to pay for the wood, and I’m doing good," he said, stating he acquired his skills 10 years ago while living in Arizona and working under the instruction of a friend. His decorative saw blades and shotguns—all made entirely of wood—are among the more recognizable crafts at the fair, and pay homage to hunting, farming and the timber industry, among other themes. Now that the winter fair has concluded, craftspeople and their fans can look forward to the spring fair, expected to take place the week of May 9. For information on how to book a table for the event, contact Ryderwood Women’s Club President Marty Blondin at (360) 295-0096.